To know me is to know the almost-inappropriately deep degree to which I love Trader Joe’s. And I’m not alone in my devotion. The quirky, service-driven chain has even inspired a nebulously legal Canadian spinoff for our TJ’s-deprived neighbors to the north. But what, you ask, is the basis of my torrid — and tasty — love affair with TJ’s? It’s so much more than cheap groceries… but yeah, that helps, too. I could list so many more than that, but I’ll try to stick to just 10. 1. The company treats its employees really well. As important as it is to save money, it’s even more important to treat people with respect — especially people working sometimes-unglamorous retail jobs. Trader Joe’s starting salary averages well above most states’ minimum wage at about $12 to $13 an hour, per Glassdoor. Plus, according to one former employee’s testimony, the company uses a novel policy to ensure its customer service team is happy and ready to help with a genuine smile: It makes sure enough employees are scheduled. “They totally overstaff so that you don’t feel like your stocking duties or your register duties trump interacting with customers,” an anonymous source told PopSugar. “They encourage you to be nice to customers.” Imagine that! But in a world filled with big-box stores that frequently cut corners — including employee wages and benefits — for their bottom lines, Trader Joe’s integrity is a standout attribute that would keep me coming back even if everything else about it sucked. Luckily, that is not at all the case. 2. The customer service is baller. Treating your employees well isn’t just admirable. It also pays off. I can vouch. Upon seeing my purchase of the famed and wonderful mini heirloom tomatoes, my cashier once asked me if I’d ever paired them with fresh ciliegine and balsamic glaze. When I then admitted, wide-eyed, that I had not — but definitely wanted to — she ran and got the other ingredients for me while I unloaded the rest of my cart. Not only did that cashier give me the gift of a delicious snack recipe I’ve made again and again (and save me a few spare steps), she earned the store some extra bucks without making me feel sleazily upsold. That’s how to do customer service, folks. 3. They honor third-party coupons. Although the company itself doesn’t manufacture coupons and sees “sale” as “a four-letter word,” if you’ve got a third-party coupon for a product stocked at Trader Joe’s, the store will honor it. And since the company carries brands like Bob’s Red Mill, Lactaid milks and Amy’s Organics, you’ve got a decent shot at finding an applicable deal. Not sure where to start? Here are 100 sources for free coupons. 4. You can bring stuff back. Yes, even if you already opened the package and taken a few bites. Trader Joe’s crew members actually personally try everything they stock, so they can give you informed recommendations. If the team thinks something just isn’t very good, it won’t end up on the shelves. Trader Joe’s has enough faith in its culinary curating that it offers you the chance to try anything in the store, 100% risk-free. 5. The wine is cheap, but still really awesome. I’m not talking about the (in)famous Two-Buck Chuck — although for what it is, even that’s not bad. But you can consistently land a decent bottle at TJ’s for ten bucks or less, whether you’re craving a classic chardonnay or cabernet sauvignon or looking to try something more adventurous. Vinho verde, anyone? The selection? Wide. The origins? Many. The price? Under $5 in lots and lots of cases. To be honest, this bullet alone could probably replace the entire list for me. 7. The Fearless Flyer is the closest thing to a literary masterpiece you’ll ever get for free. Collecting my mail is so much better on days I see the Fearless Flyer waiting for me. Trader Joe’s, as I mentioned, doesn’t run price specials or sales — on the basis that its prices are as low as possible every single day. But it still runs this amazing circular, which you can grab for free at the front of the store if it doesn’t land in your mailbox. Not only does it have lots of seasonal recipe ideas and fun facts about Trader Joe’s and its products, it’s legitimately well-written. As in, it’s the closest thing you’re going to get to a literary masterpiece to show up free at your doorstep… at least a literary masterpiece to do with groceries. Sorry, Steinbeck fans. Don’t believe me? Check it out for yourself. It’s published (and archived) online, too. 8. The prices are pretty darn fair. When I did my supermarket comparison to find the best prices on the staples I keep in the house all the time, Trader Joe’s came in second to Walmart — but when I took my dietary preferences into account, it was the clear winner. And although it doesn’t have the best price on every item, it offers great value in lots of cases (psst: here’s our guide to what to buy and what to skip). TPH reader Becky Provost says she loves to buy peanut butter from Trader Joe’s. It’s the “best price” she’s found on the plain-old peanut variety. And when you’re flipping through the Fearless Flyer, you’ll sometimes see it mention the last time the company changed the price of a given item — sometimes, it’s been several years. 9. It’ll give you a chance at free money for doing something you should be doing anyway. Need an incentive to finally start bringing your own reusable bags? Trader Joe’s runs a bag raffle! Just bring your bags and write your name and phone number on the slip for a chance to win a free $25 to spend on groceries next week. Saving the world and giving away free food at the same time? Heart. Eyes. 10. All the signage is hand-designed. You won’t see any sterile aisle signs hanging at your local Trader Joe’s. Every piece of advertising signage in the store is hand-drawn and, thus, unique. In fact, “sign artist” used to be a specific role you could fulfill at Trader Joe’s, although nowadays the company relies on general crew members who have an artistic bent. Regardless, it’s nice to see a human touch instead of uniform block letters when you’re figuring out where the tortillas live. Plus, it lets the store easily switch up its displays — which keeps your shopping experience fresh from week to week. 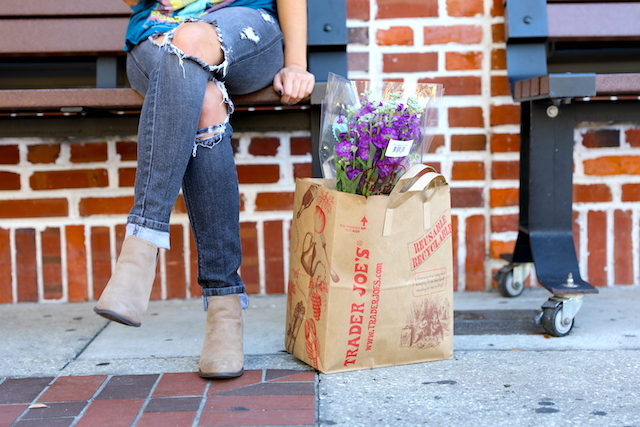 Your Turn: Why do YOU love Trader Joe’s? Jamie Cattanach is a staff writer at The Penny Hoarder whose first priority, when signing a lease, is to look up the closest Trader Joe’s. Find @JamieCattanach on Twitter to wave hello.